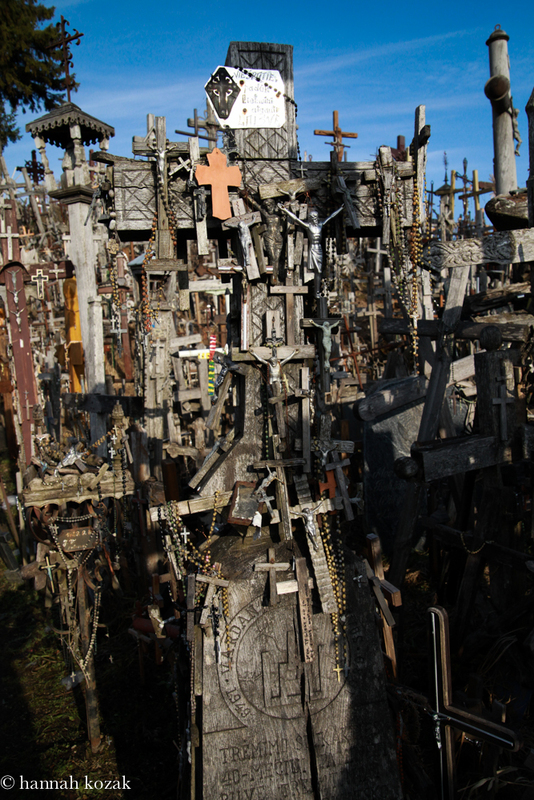 I made a side trip from Warsaw to visit The Hill of Crosses in Lithuania. 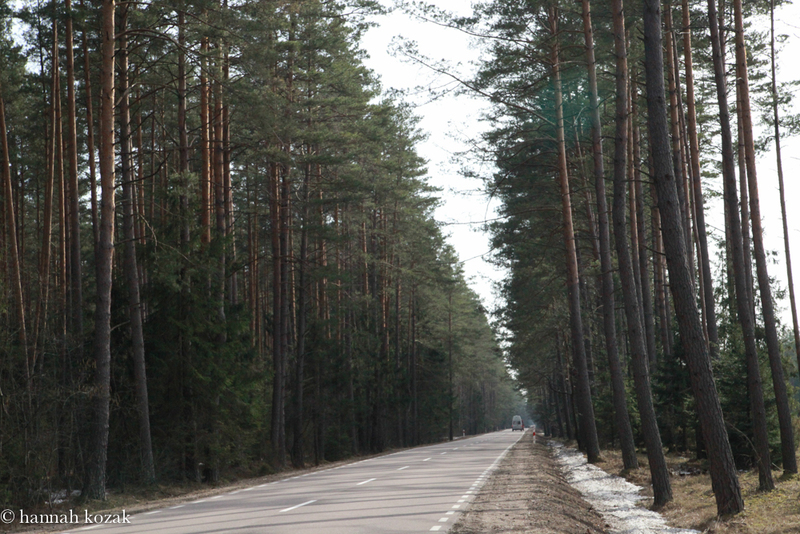 From Warsaw, it’s an eight hour drive on tree lined roads. Since the times of the Crusaders, people have been making pilgrimages to this unusual site. 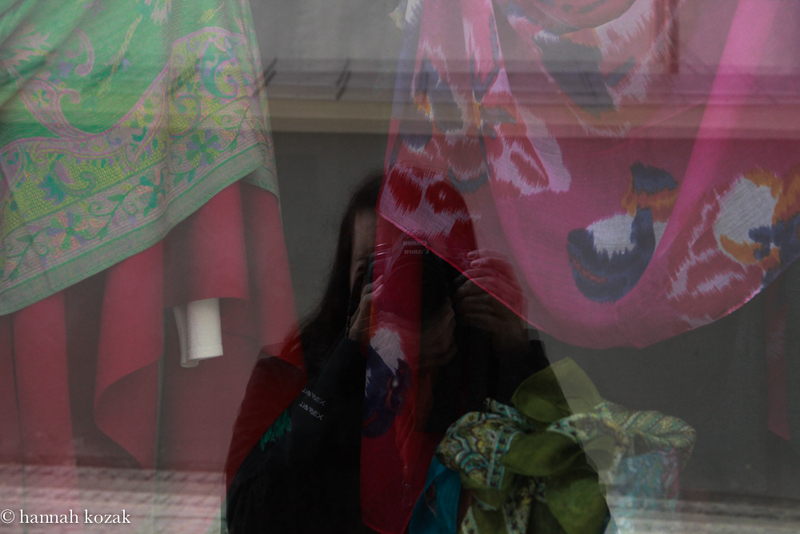 It is neither easy to get to nor to find but it is well worth the journey into Northern Lithuania. As we drive on the road, I see broken lamps; metaphors from the days of communism. 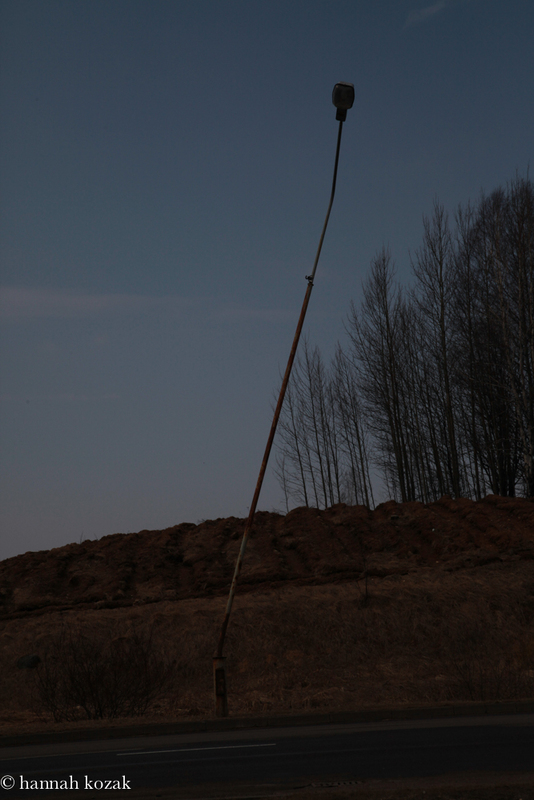 The further east you go, the more symbols like the broken lamp one sees. My friend Hanna says “I have cake from my mother, special for you.” Her mother had baked a coffee cake for our road trip, another act of kindness. We listened to Michael Jackson, we listened to silence. Poland was and is full of trees along the roads. The trees served a purpose during WWII; the main strategy was to hide the tanks from the planes. Even if a plane noticed the tanks, it’s hard to hit a tank so close to many trees. 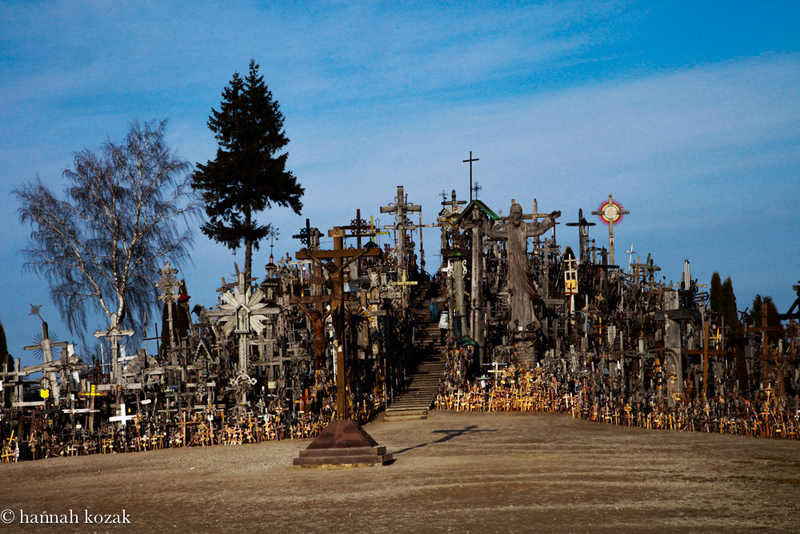 On a hill, in the town of Siauliai, are thousands of crosses in every size and shape. 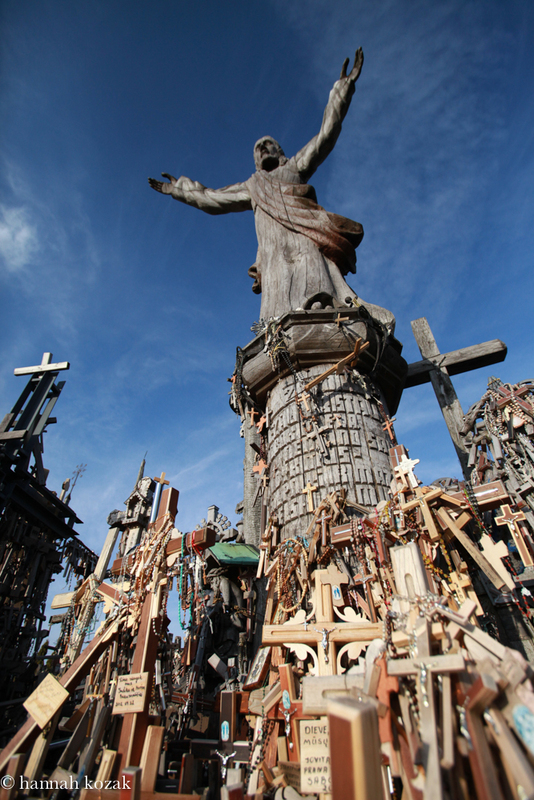 Not only crosses but crucifixes, Virgin Mary statues, Lithuanian patriot carvings, tiny rosaries and effigies.The crosses combine elements of architecture, sculpture, blacksmith art, and painting. I left a wooden cross from Mexico and another from my dearest friend in a corner of the hill that seemed perfect. 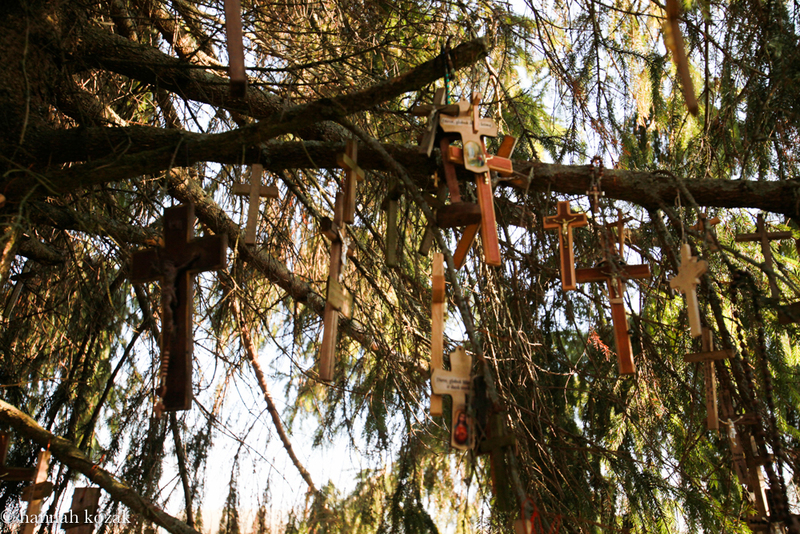 My friend from Poland, along with her gentle, kind son who drove us, left four crosses. 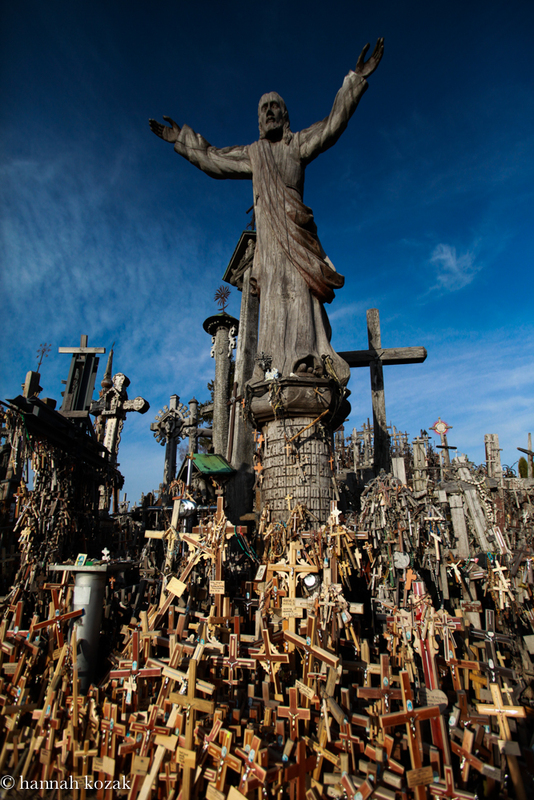 The first crosses were placed there 182 years ago by relatives killed during an anti-Russian uprising in 1831. 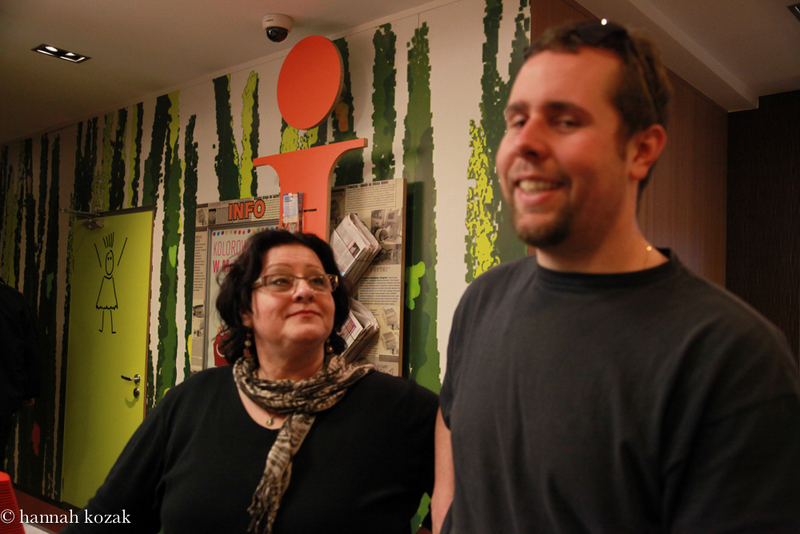 This site is a symbol of hope, of father and freedom for the Lithuanian people. As I climbed up and down the narrow paths, I felt stillness and in the quiet, I could sometimes hear the wind chimes blowing in the breeze, creating a special musical sound. 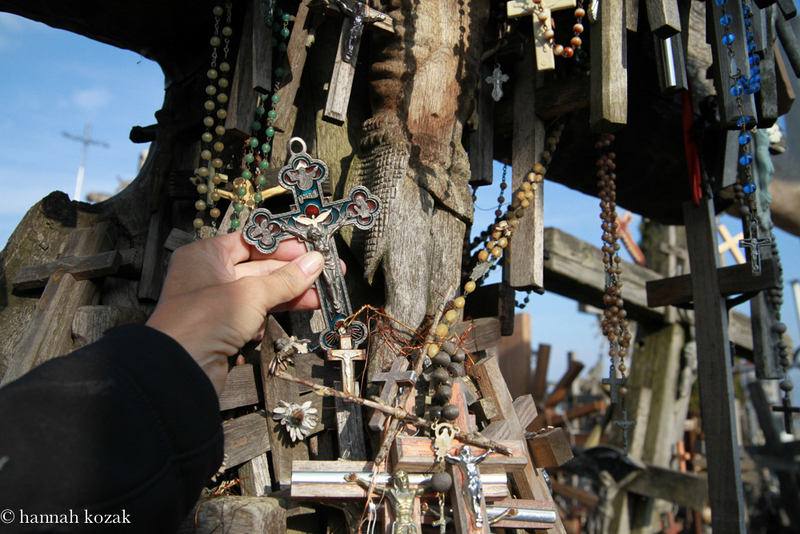 The Hill of Crosses, like Jerusalem, is experiential. My photos cannot do justice to seeing this sight in person. 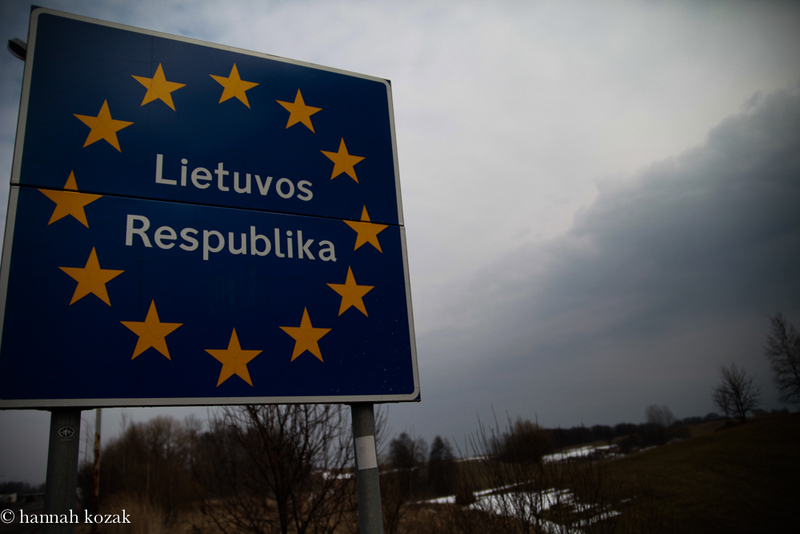 After the outbreak of the Second World War, Lithuania was occupied three times: first by the USSR in 1940, then by Nazi Germany in 1941, and finally by the USSR again in 1944. Mass deportations continued until the death of Stalin. The site has been destroyed multiple times. The Soviet government could not tolerate such spiritual expression and in 1961 completely destroyed the hill. 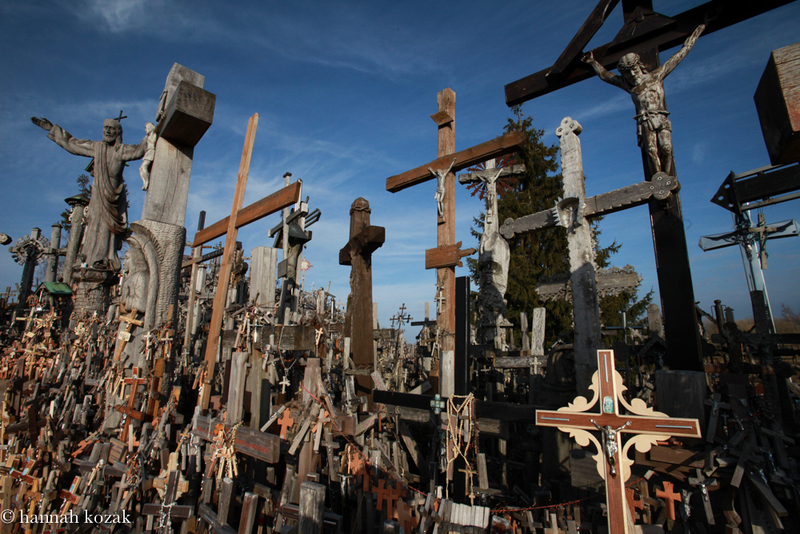 Every cross was bulldozed, burned and recycled. The crosses returned. The Soviets destroyed it again in 1973 and 1975. 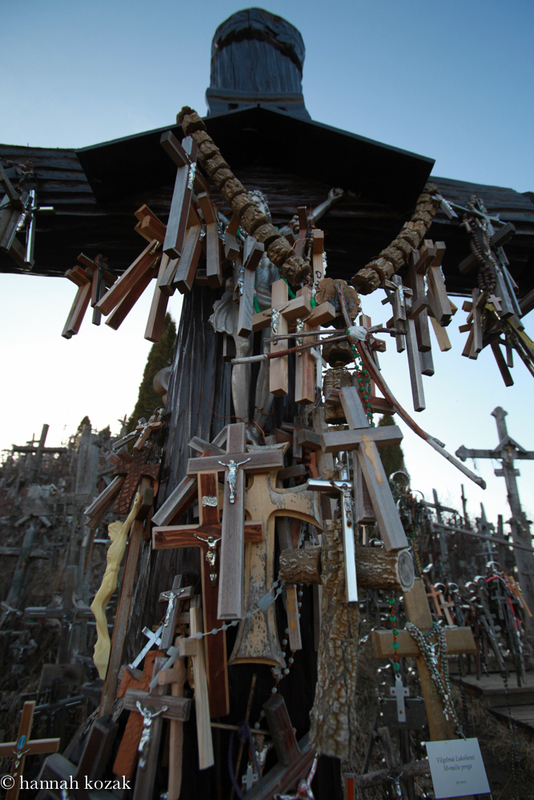 The exact number of crosses there now is unknown but there are estimates of put it at about 100,000 in 2006. 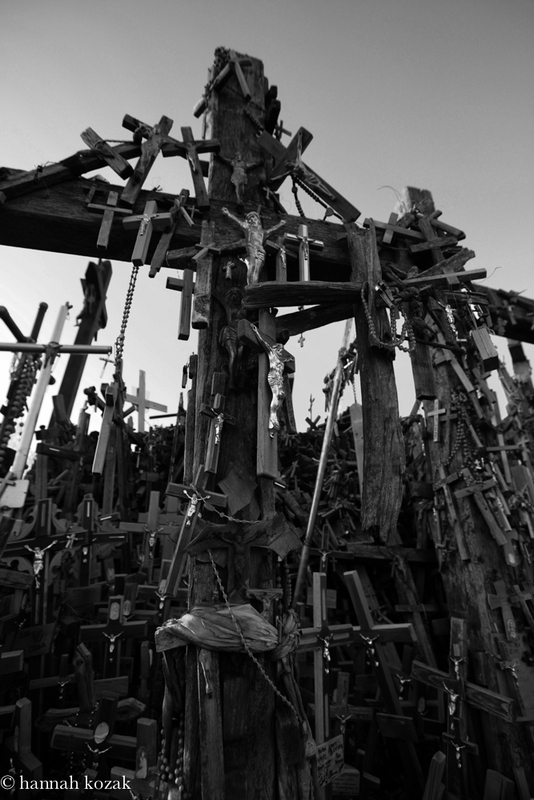 The Hill of Crosses took my breath away as I could feel the undefeated faith of the Lithuanian people along with hope and devotion, even amidst the suffering. 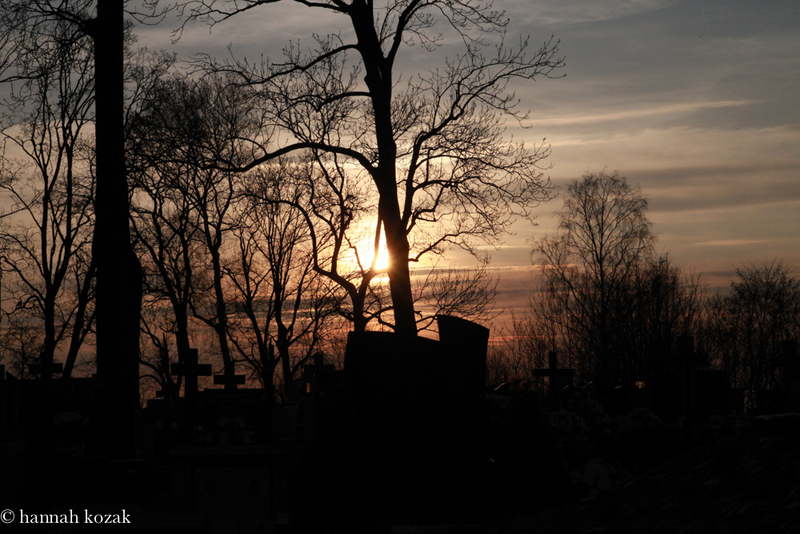 The country suffered a 33% population loss due to the Holocaust, executions, incarcerations and forced emigration. 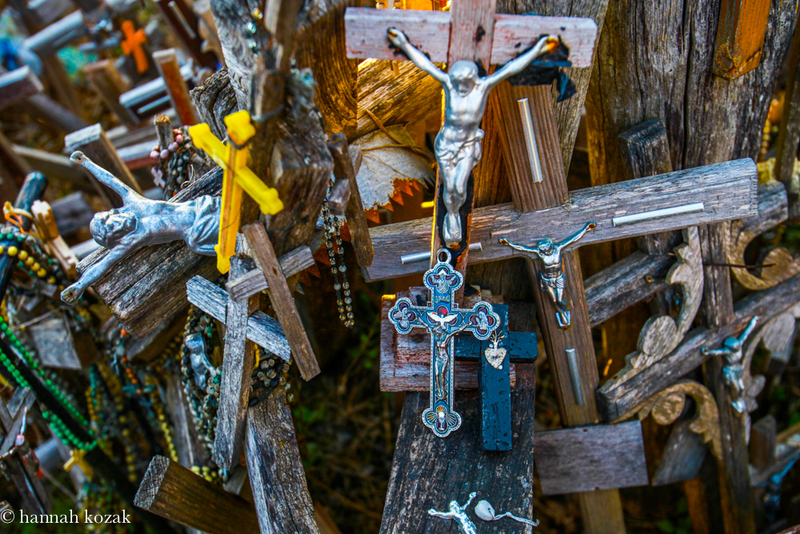 Two crosses I placed; one from Mexico and one from my closest friend.